In this week’s episode, Andrea, Brad and Jeff discuss the pros and cons to training at home. Both Brad and Jeff are high-level athletes who utilize the efficiency of having a home-gym, to balance their life demands with serving their athletic goals. Each coach describes in detail, the equipment, size, and location of their home-gym. Along with discussing layouts, they also touch on common assumptions about training at home, limitations, how they structure when they train, how they motivate themselves, and more. 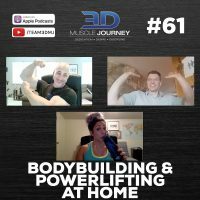 If you are considering building a own home-gym to help increase the efficiency of your training or for some other reason, give this podcast a quick listen to help you finalize your decision. 15:28- Do the coaches feel like they “missed” anything when transitioning to their home-gym?